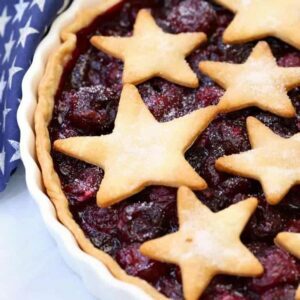 Make this Bourbon Soaked Cherry Pie the next time you need a fun dessert! 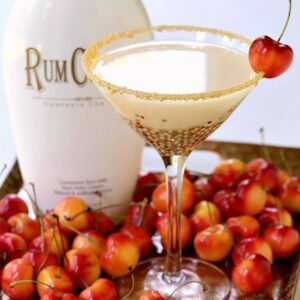 Fresh cherries mixed with bourbon make this pie a prize winner! So do you guys get so excited in the summer when all the fresh produce is out that you buy way too much of it and then try your hardest to get through it all? Sometimes Christie and I are out in different places and we both come home with vegetables from one farm stand and fruit from another…then you find your favorites and buy way too much of that so…you’ve got lots of fruit and vegetables to eat. Definitely not a bad thing but on the other hand you don’t want it to go bad before you get to it either. That’s when we start breaking out soup recipes like this Summer Grilled Chicken Noodle Soup or pasta dishes this Spaghetti with Fresh Corn and Clams. As far as fruit goes? Well, usually that doesn’t stand a chance in our house. Our boys will eat fruit like it’s the last meal they’ve ever had…sometimes 3 or 4 peaches at a time for instance. Each. When it was time for fresh cherries to go on sale, which are normally pretty expensive, Christie and I both grabbed a couple of bags at the store…so we ended up with a ton of cherries. And after a day or so of finding cherry pits that somehow missed the garbage can, or were under the table, I knew it was time to put these cherries to good use. In comes this Bourbon Soaked Cherry Pie. We love making pies with fresh fruit when its at it’s best flavor – our standby when no decent fruit or berries are around is a classic Apple Pie, because that always seems to turn out good. 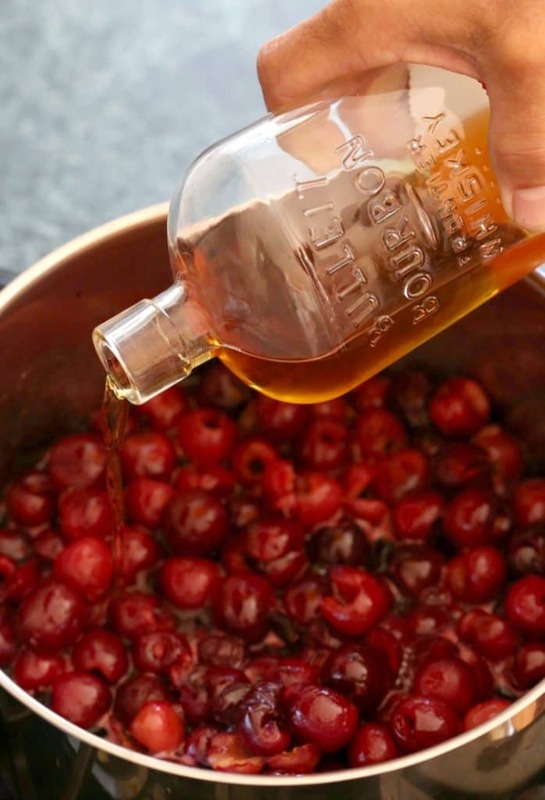 I’ve said it before and I’ll keep saying it – I really don’t like recipes that say they are “boozy” or call for bourbon or rum but have like 1 teaspoon in the while recipe. Come on, people. That’s not boozy. 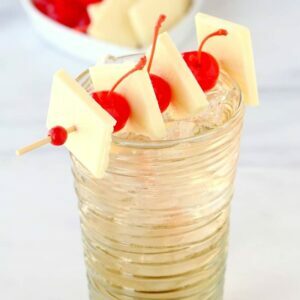 When I make a recipe with some sort of alcohol I want to be able to actually taste it – not to have it be too overpowering, but at least taste it in there. Otherwise I say son’t bother putting it in at all. This Bourbon Soaked Cherry Pie though will not fall into that category. 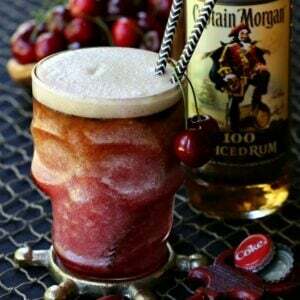 You can definitely taste the bourbon and it makes the cherries taste even better than you’d think. Bourbon and fruit definitely go together. 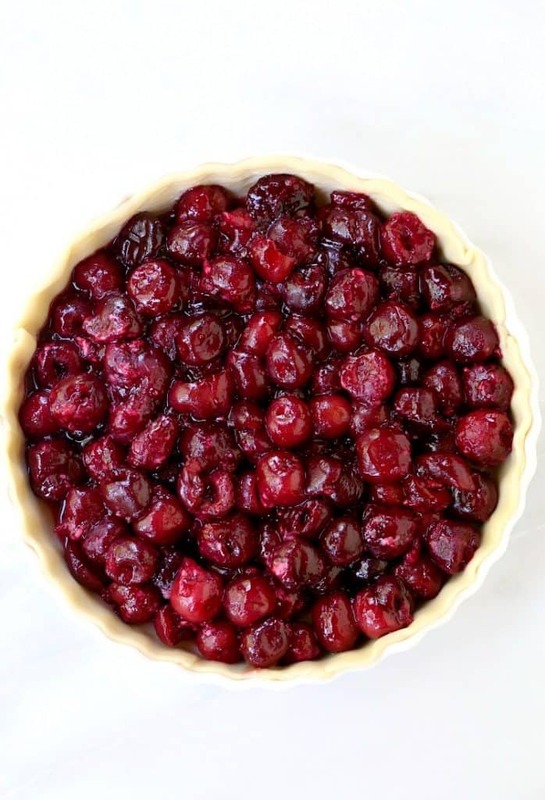 And I’m going to say that you really don’t need to make your own pie crust…I know it’s better when it’s homemade but I just buy the best quality I can find at the grocery store and I get that boozy, cherry filling in there. I cut my top crust into stars but you can put the whole crust on if you want to, or cut out your own shapes. Then just bake and serve. It’s boozy. It’s fresh and fruity, and most of all – it’s crazy tasty! In a large pot add the cherries, sugar and lemon juice. Cook over low heat for 10 minutes, then sprinkle in the flour. Stir and let mixture thicken and then remove from the heat. After removing the pot from the heat pour in the bourbon and stir to combine. Let the cherry filling cool slightly. 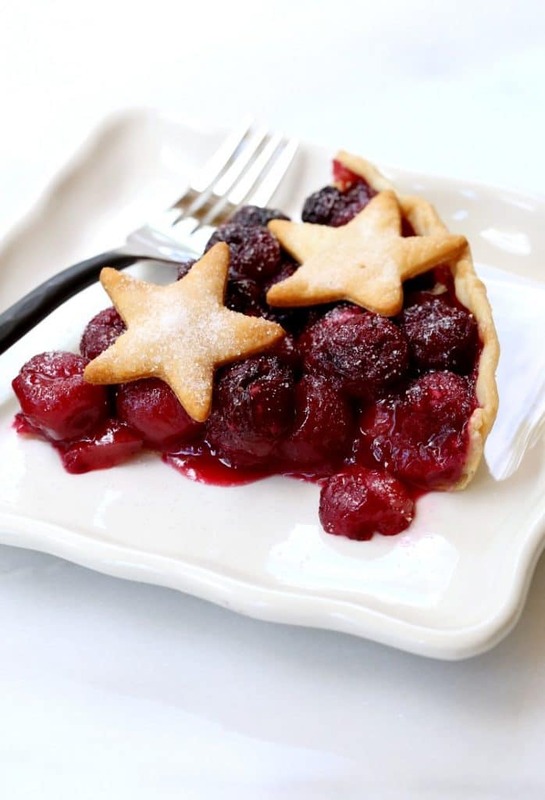 Press one round of pie dough into a pie dish then pour in the cherry filling, evening out the top. While the pie is baking, on a separate baking sheet cut star shapes (or any shape you want) out of the top round of dough and bake for 10 minutes. 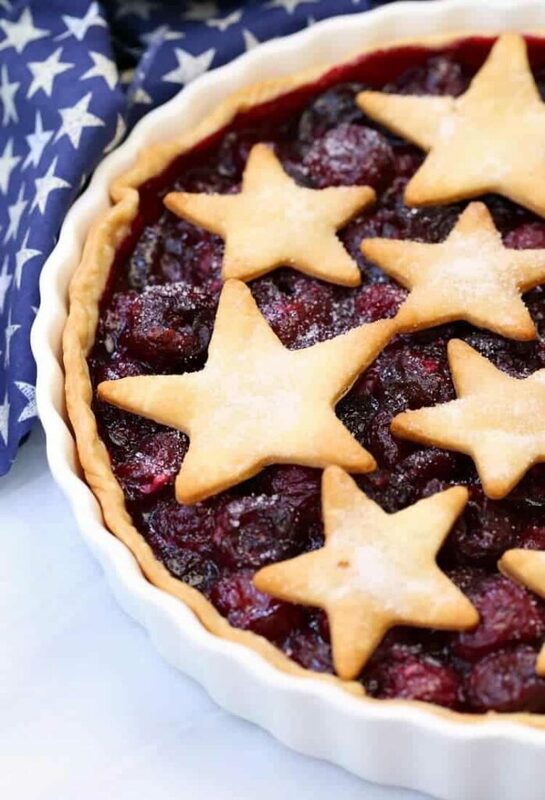 When the pie comes out of the oven, add the star shapes to the top of the pie. Brush with cream then sprinkle the starts with sugar. 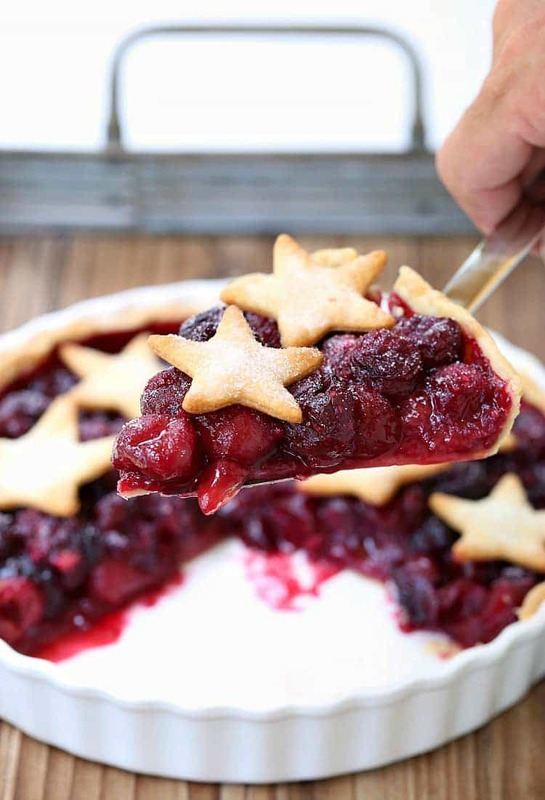 You can use the whole pie crust on top instead of cutting out shapes. When making the pie this way, add the top crust to the pie before baking and crimp together with the bottom crust.